Businessman Sean Quinn has claimed he was “stabbed in the back” by his former company. The former owner of the Quinn Group quit as a consultant with Quinn Industrial Holdings (QIH) in May 2016, when he and his son Sean Jnr left by mutual consent. On Tuesday night, the controversial businessman told supporters at a public meeting that he has been “trying all along” to buy back his company. The meeting was called by an organisation calling itself the Cavan, Fermanagh and Leitrim Community Group to update the local community on the happenings in the group – but management of QIH did not attend. 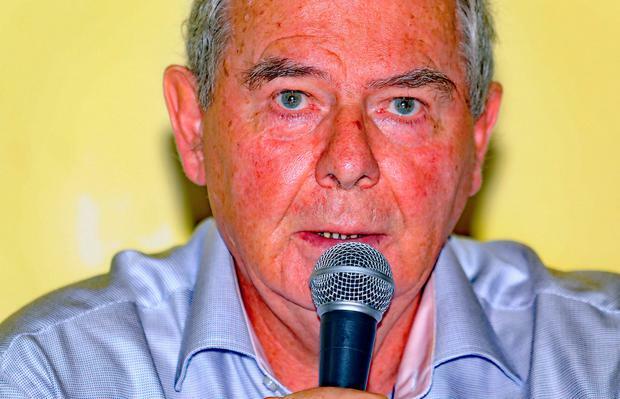 Speaking in front of hundreds of supporters in Ballyconnell, Mr Quinn claimed he was prevented from buying shares in the company due to a clause inserted in a management implementation plan. “This… was to make sure the Quinns couldn’t get any of the business and to make sure the junior directors signed up the document that said you can’t give your shares to Sean Quinn or to anybody else, you have to keep them yourself,” Mr Quinn said. However, a source close to QIH has insisted that with any private equity-funded management incentive scheme, shares cannot be transferred to any party without the approval of the owners. This would apply equally to senior management as to junior management. At the meeting, Mr Quinn insisted he is still the most suitable person to run the company. “I’ve been trying all along. I’ve said it a lot of times that I wanted to buy the company, I wanted to buy all of it,” he said. In a statement last night, QIH said: “Management from the company did not attend the meeting, which unfortunately appeared to be set on airing inaccurate representations of the company’s prospects.